My friend and fellow-quilter. Julie Shaw, was asked by one of her long-time buddies. Judy Bristow, to make a double bed quilt Judy did not want an intricate patchwork pattern and Julie enjoyed quilting so they decided on an Amish quilt. Julie sketched a simple diamond design and together they bought cotton fabrics in strong medium and dark colours chosen to match Judy’s print curtains. Then Julie’s health deteriorated and the fabric stayed in the cupboard. Julie still hoped to fulfil her friend’s wish but it became clear that she was not even going to be able to begin the project. Shortly before she died I promised to see that Judy got her quilt. While completing the two cushion covers Julie had been making for another close friend. I contemplated the undertaking I had made – it was quite a daunting prospect. Julie’s first love was hand quilting – she said that the act of sewing simple running stitches soothed her and helped her through life’s ups and downs. Her patchworks were densely quilted with backgrounds filled with simple pattern – circles or straight line, often freehand. She also loved feathers. Her style was firmly traditional. She would have put so much love into the Amish quilt for Judy. A plan emerged – I would machine piece the top and choose quilting designs, then seek the assistance of local quilters to do some stitching in memory of Julie or in celebration of friendship, or because they too loved hand quilting. At the next stage – choosing quilting designs and making templates – I was entering new territory, having only made two miniature quilts in the Amish style in the past. 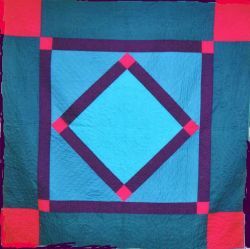 Traditional Amish quilts often feature a double feather circle in the centre diamond around an 8-pointed star. Taking great care with the bias edge of each large triangle, I machine pieced the quilt top, it went together well. Marking the quilt design on the top was the next task -one I approached with some trepidation. Jenny Hutchison of Strawberry Fayre. who knew Julie for many years, offered the use of her very large table and to help she recruited Joyce Miller. I took Jane Newsham along from Exeter. It took a full day. Joan Tunstall responded to my invitation at S.W.Q.’s A.G.M. (2004) to people to join in the hand quilting. She made a significant contribution, as did Jenny, Joyce and Jane. I did quite a lot of the quilting and enjoyed it much more than I had expected. I began to understand Julie’s pleasure in the act of quilting and to appreciate the beautiful patterns and textural effects achievable by quilting for its own sake, rather than as an adjunct to patchwork or applique, as in most of my previous work. An Amish Diamond Quilt has much in common with a whole cloth quilt in this respect. A narrow bias binding completed the quilt. Judy was thrilled with it “A lasting reminder of a lovely friend”. I have many positive memories of this project. Julie’s daughter, Nikki, joined me to sew one very special evening. Old friendships were refreshed and new ones begun. I brought from it the confidence to tackle large scale quilting design projects in the future and to put in a lot more dense stitching – as Julie would have done!